Do you have plans to travel to international destinations? Check the new Cebu Pacific international seat sale as low as P799 base fare. This could be the promo fare you are looking for if you wish to fly to foreign countries in the next 5 months. Travel period for this seat sale starts March 1 and ends July 31, 2019. Selling period for the promo tickets is until February 7, 2019. The Cebu Pacific promo fares are good for one-way trips to Asian destinations from Manila, Cebu, Clark and select trips from Davao, Iloilo and Kalibo. Book or buy promo fares as soon as possible, limited availability of promo tickets on sale. To get Cebu Pacific sale tickets fast, book online at www.cebupacificair.com. Promo code not needed in booking. Another way of getting the low fares is by purchasing ticket at Cebu Pacific sales and ticket offices. You may also buy the affordable fares at accredited booking offices as well as travel agents. Reserve ticket by calling Cebu Pacific Reservation Hotline Numbers. 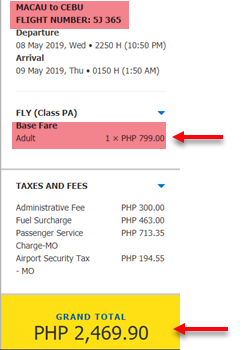 Cebu Pacific promo fares are non- reroutable and non-refundable. Re-booking of sale ticket is allowed subject to re-booking fees and penalties. 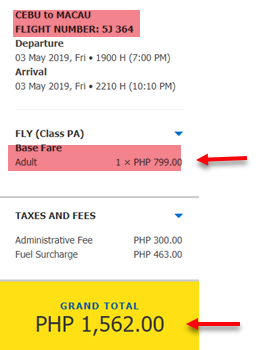 international promo ticket of Cebu Pacific covers the base fare only and do not include Web Admin Fee, taxes, Fuel Surcharge and International Airport Terminal Fee. Up to 7 kilos hand carry baggage included in the sale ticket but no checked baggage allowance. Want to receive promo fare updates? 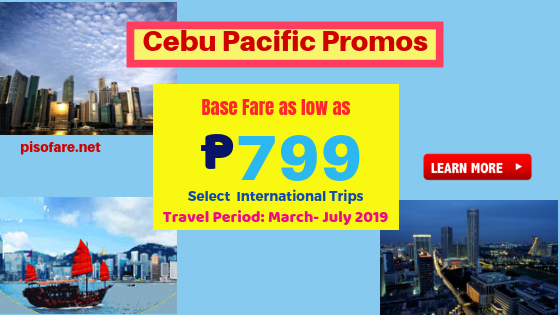 Like and Follow us in Facebook: PISO FARE TICKET to get Cebu Pacific seat sale and promo updates 2019 and PAL promo tickets 2019- 2020!